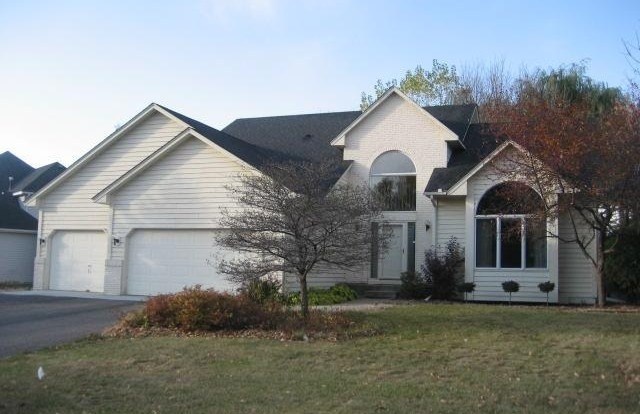 This two-story home located at 17793 George Moran Drive is in Eden Prairie MN. 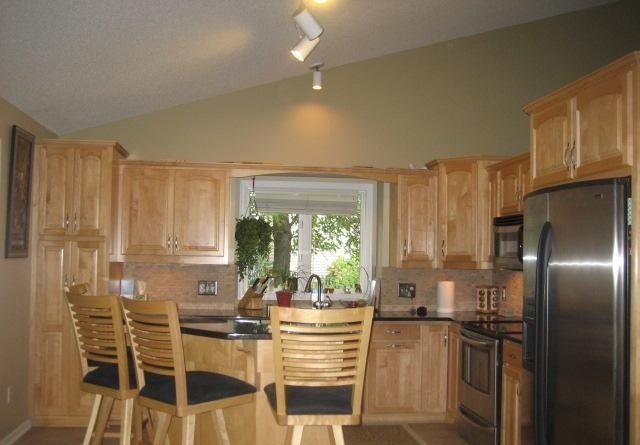 Built in 1993, it is situated near Mitchell Lake with 5 bedrooms, 3 bathrooms, and 3,002-square-feet of space. 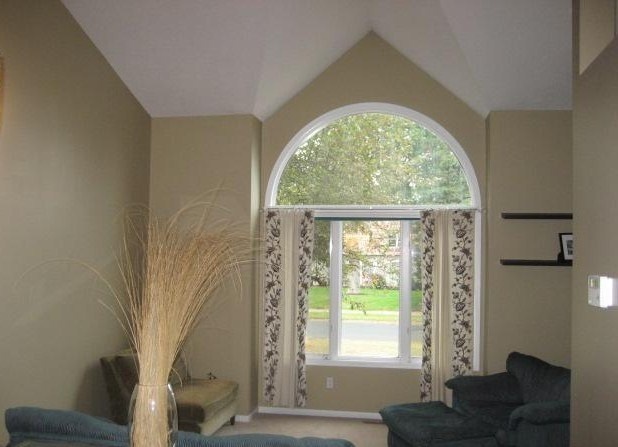 This home has spacious vaulted ceilings and a built-in workspace. With its close proximity to the lake, residents here have easy access to local parks and trails systems. The kitchen is equipped with stainless steel appliances, granite countertops and maple cabinets. It could all be yours for $324,900! 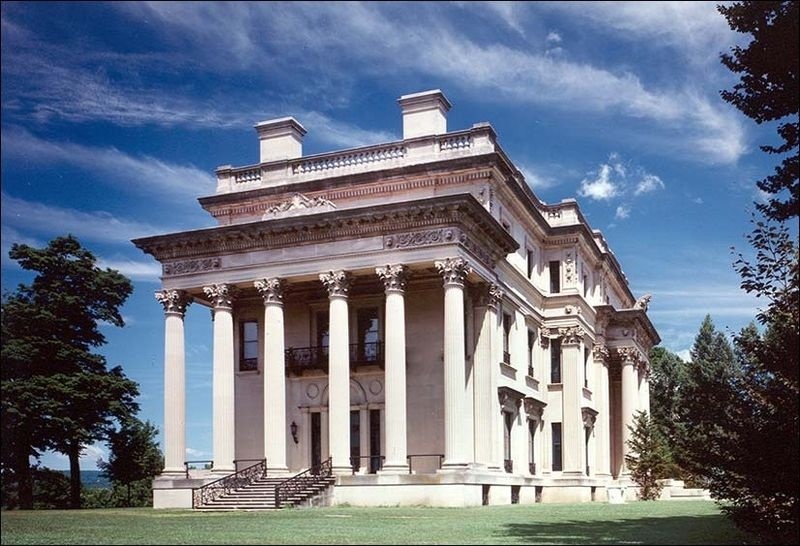 Combining classical Greek and Roman architecture with Renaissance ideas, the Neoclassical Beaux Arts style was favored for grand public buildings and opulent mansions from 1885 through the 1920s. Also known as Beaux Arts Classicism, Academic Classicism, or Classical Revival, the Beaux Arts (French for "fine art") style originated in the École des Beaux Arts in Paris. Many American architects studied at this renowned school to learn about the aesthetic principles of classical design in order to bring that knowledge to the United States. Beaux Arts buildings are characterized by order, symmetry, formal design, grandiosity, and elaborate ornamentation. Massive and grandiose, they are often constructed primarily out of stone. Columns, cornices, pilasters, and triangular pediments are characteristic features. Beaux Arts homes often have balconies and balustrades as well. The interiors are usually lavishly decorated, with grand staircases, large arches, and less obvious details like swags, medallions, flowers, and shields. There have been prime examples of the Beaux Arts architectural style Calhoun Isles community of Minneapolis. The French Normandy or French Norman style is named for architecture found in the Normandy province of France, starting in the Middle Ages. At the time, people in Normandy and the Loire Valley of France attached their farm silos to the main living quarters instead of to a separate barn. During the 1920s and 1930s, an Americans revivalist movement romanticized the traditional French farmhouse, constructing buildings that take their cues from ancient French rural residences. Many plans include a small round tower topped by a cone-shaped roof, resembling the grain silos of the ancient Normandy style. The architecture is characterized by steep, conical roofs or hipped roofs and round stair-towers. They generally have stone walls and an asymmetrical plan. Like Tudor style houses, 20th-century French Normandy homes may have decorative half-timbering. Unlike Tudor style homes, houses influenced by French styles do not have a dominant gable in the front. There are a range of building styles these homes can resemble. Some appear to be cozy and romantic cottages. Some French Norman style homes look like small castles. Ther are homes of this styles in Minneapolis and other Twin Cities communities. The Cape Cod style home originated in colonial New England. 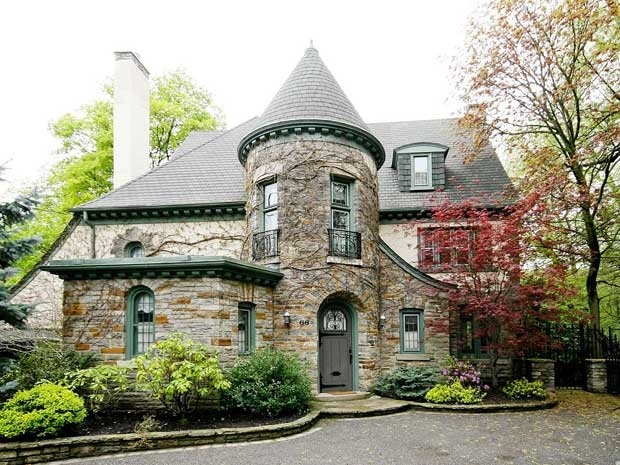 They were built by English Colonists as early as the 1600s and were popular through the 1930s, 1940s, and 1950s. In colonial days, a Cape Cod house was a simple, one-story structure made of wood with a single chimney in the center. Cape Cod houses have 1 to 1/2 stories, a steep roof with side gables, dormers for light, shutters, and little exterior ornamentation. Cape Cods tend to have a more symmetrical appearance, with a door in the center, but that is not a hard and fast rule. Some homes in Inver Grove Heights are great examples of modern Cape Code style architecture. 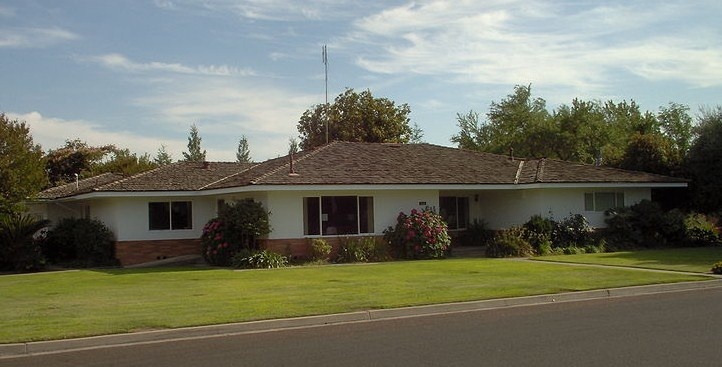 The uncomplicated Ranch house evolved from several 20th century styles, including ramblers and bungalows. They were popular from 1945 through the 1980s. Sometimes referred to as a California Rambler, Ranch Style houses are usually one-story tall and rectangular, L-shaped, or U-shaped in design. The horizontal layouts tend to be long and narrow. They have a low-pitched gable roofs, deeply-set eaves, attached garages, and large windows. There are some fine examples of Ranch style architecture in Edina MN. Frank Lloyd Wright was an American architect, interior designer, writer and educator, who lived from June 8, 1867 to April 9, 1959. His over 1,000 designs and 500 completed projects include innovative examples of many different building types, including this Mayan Revival home, but one of the things he is most famous for is his promotion of organic architecture and the development of the Prairie School (or style) home. Organic architecture is a philosophy of design which promotes harmony between human habitation and the natural world. The land, the buildings, furnishings, and surroundings all become part of a unified, interrelated composition. It was popular between 1892 and 1920. When he developed the Prairie Style, he had organic architecture in mind. Because he was born and raised in Wisconsin, he was also heavily influenced by the rolling prairie landscapes found in Minnesota, Wisconsin, and Illinois. His surroundings and philosophy contributed to the creation of the Prairie School Style. The Prairie School style incorporates low horizontal lines that blended into the surrounding flat, prairie landscape.Thinking that rooms in traditional Victorian era homes were closed-in and confining, he designed houses with more open interior spaces. Rooms were often divided by leaded glass panels instead of ordinary walls. Furniture was either built-in or specially designed for their respective spaces. These homes were called prairie style after Wright published a house plan in a 1901 edition of Ladies Home Journal titled, "A Home in a Prairie Town." Tudor Revivals are early 20th century re-inventions of Medieval cottages and even palaces. Sometimes they are also referred to as Medieval Revivals. Tudor Revival houses have decorative half-timbers exposed to give the appearance of a medieval house. They may even have a false thatched roof. Decorative woodwork and some brick-work can be found on the exterior walls. Tudor style homes may also have steeply pitched roofs, massive chimneys, prominent cross gables, and narrow windows with small panes. 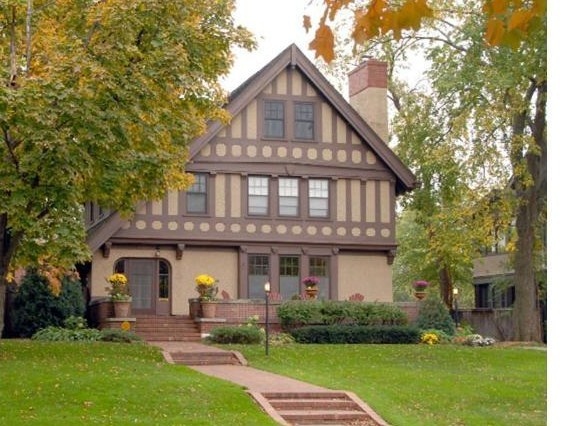 There are many stately Tudor Revival styles homes in the Southwest Community of Minneapolis. The Victorian Queen Anne style became an architectural fashion in the 1880s and 1890s. The industrial revolution brought new technologies that enabled builders to use pre-cut exterior trim that had been mass produced to create whimsical looking houses. Victorian Queen Anne homes often have round or square towers, turrets, wrap-around porches, and other fanciful details. Queen Anne houses may also have a steep roof, front facing gables, an asymmetrical shape, bay windows, and ornamental spindles and brackets. The house shown below is an excellent example of Victorian Queen Anne style architecture. 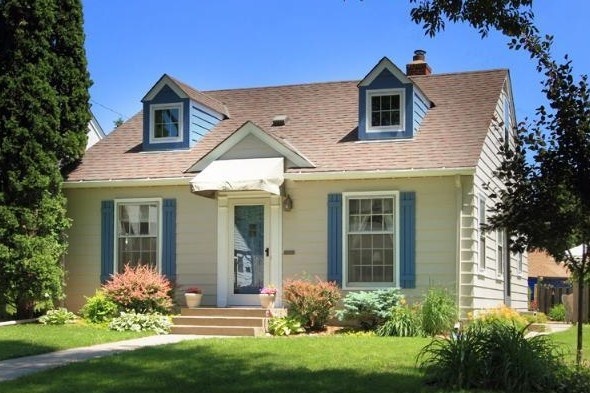 There are many houses built in this style for sale in the Bryn Mawr neighborhood of Minneapolis. The original Georgian style was named after the four kings named George who reigned successively from 1714 to 1830. Rooted in the classical design principals of ancient Rome, Georgian was the dominant style of early American colonies Homes in the Georgian style are rectangular, generally made of brick or wood, and have a balanced façade with a paneled front door in the center. A decorative crown often adorns the top of the door, usually accompanied by columns. The chimneys are usually paired on these homes, so as to contribute to overall symmetry. There are great examples of the Georgian Revival style in the Calhoun-Isles community of Minneapolis.